SS20 Similar in performance to SV10, but lets in a little more light. External & internal finish is mirror. 20% light transmission. NS05 This film is non-reflective, black finish. Excellent privacy and glare reduction. Has a higher heat absorption and not suitable on some glass. DN20 is a semi-reflective film with good privacy, heat & glare reduction..
IR50 is the only window film safe on laminated glass, due to its very low heat absorption. Although a very light tint, it rejects over 50% heat. ﻿SV25 One of the most versatile window films for your home. SV25 offers very high heat rejection and privacy, without making the room too dark. The exterior finish is reflective, but not a mirror. Blue/Grey in colour. DN50 Our most popular film where fade protection only is required. (Please see the blog section on this site about fade protection) DN50 has a light colour, but does not really change the look of your property. Daydream 25 is proving to become our most popular film choice with excellent privacy and heat rejection properties. There are many more film types available and will be added to this list over time. Etched & Silver Etched Glass This is our workhorse. The reason we find it so useful is because of the way it will stay over time. In the past, we used another brand, cheaper and easier to apply, but over time, it would shrink away from the edges. This was not good the customers, so we changed. When using a frosted film facing the sun, (internal or external application) only a cast vinyl will keep its shape. If you compare, ask what kind of film it is, before committing to a product. Sparkle Another popular film, with small flecks, giving the film a sparkle. Patterned Film We carry a range of economical patterned film. This is much cheaper than having a pattern cut by computer. These films are more suitable for internal use, such as office partitions or shower enclosures. When the cooler time of year approaches, we get request for Insulating Window Film. We do carry a highly effective Low-E film to keep heat in. For budget concious households, DIY Insulating Film may be worth considering. EECA Energywise is recommending the use of DIY Insulating film as a cost effective alternative to double glazing to trap the winter warmth inside your home. We sell the film in rolls of 1.5m x 3m at a cost of $33.50. All you need is a pair of scissors and a hair dryer to install this on your wooden framed windows and doors. You've seen it, the mirrors etched, shop windows scratched and bus shelters "embellished" with some budding artists piece of work. Not only is it ugly, it's also costly to erase. Options to get rid of this sort of graffiti call for either replace the glass or mirror, get it buffed out or use an anti-graffiti film. This is a sacrificial layer, simply removed after the damage has been done and replaced with a new layer. The picture on the left shows a mirror being tagged. Little did the culprits know, but there was a film on the mirror and when we came along, we simply removed the damaged film and replaced it, with all the art work gone... sadly. The result was a clean mirror. We often use the anti-graffiti film on glass, stainless steel or mirrors, where some etching is already there. Using the film over the scratches does actually hide them in most cases, so there is no need to replace or polish the surface first. 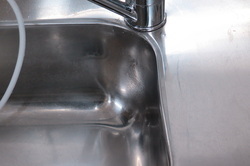 Do you have a problem with getting marks off glass, stainless steel, porcelain or tiles and worried that you will scratch the surface in the process? 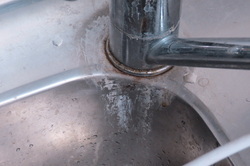 A big problem is hard water, with a lot of calcium on shower glass, bathroom tiles, toilets or sinks. Traditional cleaners will not remove these deposits. Restorex and the right combination of scouring pads will remove these deposits and make your glass look like new. We sell Restorex and the pads for you to use and also offer a removal service for those extra-hard jobs, like the showers. 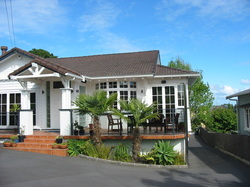 Once the surface is restored, all you need to do is keeping it looking good by using Restorex lightly once in a while. The product is very gentle on you and the environment, non-toxic, completely biodegradable and suitable in a marine situation. This window is in a shower and has a build up of mineral deposits and soap scum. The owners have tried everything to get this clean, without success. Notice the clear centre? Took me less than 2 minutes to get it "good as new"
You can buy Restorex from us, including the special non-scratch cleaning pads. We use the Euro-Cloth during the installations of our window films. My last cloth was used over 4 years, before I lost it somewhere. The reason we use and recommend the Euro-Cloth is the performance and size. There are many other brands of micro-fibre cloths on the market. Having tried some of them, we found that as with so many things, you get what you pay for. The cheaper ones from the supermarkets do not work well and stop absorbing the dirt very quickly. The other good ones are very often around the same price as the Euro-Cloth, but only half the size. If you have window film on your glass, we recommend you use a micro-fibre cloth to clean it. It is easy and will not leave any streaks. Just remember the golden rule of cleaning windows: Never do it in the sun! There are many other uses for the Euro-Cloth. Glass, stainless steel, mirrors, TV-screens or granite benches to name a few. 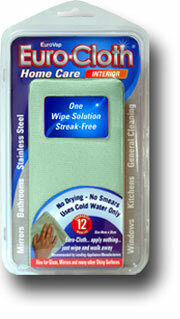 This film is specifically applied to stop fogging up of mirrors in bathrooms or refrigerated display cabinets. As a trial, I applied the film to one side of my bathroom cabinet and left the other side clear glass. I then turned on the shower full blast, without the fan going. Within seconds, the un-coated glass started to fog up, while the coated side stayed perfectly clear. The film is invisible and very easy to clean. Nobody has ever noticed the difference at my home. 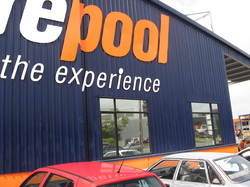 We offer a tint removal service (not vehicles) to get the glass back to the original condition. The cost is calculated by the hour.